Yesterday, I took an in-depth look at the latest wage data for select percentiles. Today, I’m going to provide a brief look at the latest wage data by educational group for the first half (FH) of 2017 compared to FH2016 and FH2007, before the Great Recession began. While FH data are, by definition, more volatile than full year data, data for this year so far indicate a mild reversal of trend from what I found in The State of American Wages 2016. 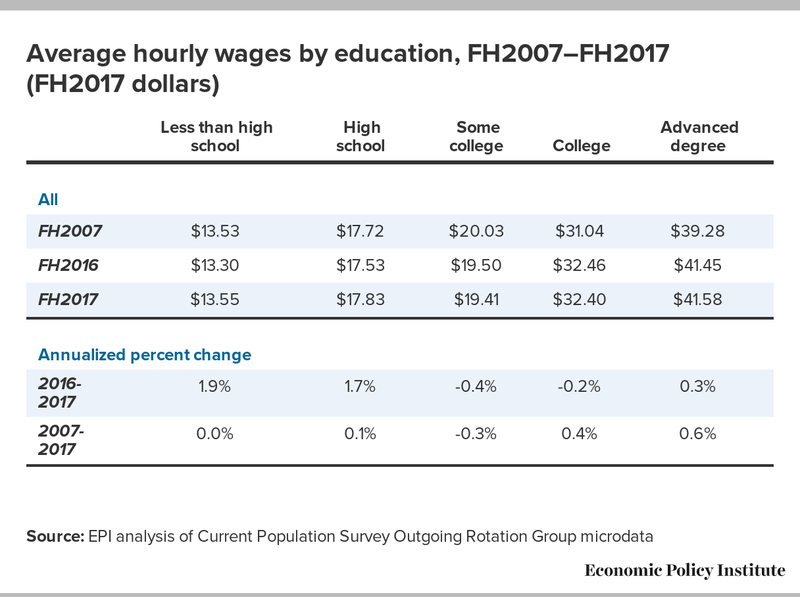 The table below shows real average hourly wages in FH2017 dollars for the five main educational groupings and annualized changes over the last year and since FH2007. It is particularly striking that the wages for workers with less than a high school degree or just a high school degree rose faster over the last year than any other group at 1.9 percent and 1.7 percent, respectively. This phenomenon is likely related to the disproportionate increases among lower wage workers. I pointed out earlier this week the likely relationship between strong wage growth at the 10th percentile and the significant number of state-level minimum wage increases that took effect at the beginning of the year. From the latest wage data, we also see that average wages for workers with some college or a bachelor’s degree fell over the last year. Because of the opposing trends in high school and college wages, the gap between those two groups fell, mildly offsetting the increases we saw between 2015 and 2016. The slight decline in average wages for college graduates is particularly striking as the unemployment rate for that group averaged 2.9 percent over the last year. While not definitive, this is a sign that there is no shortage of credentialed workers in the economy today. If there were, employers would have to offer higher wages to attract and retain the workers they want. It remains to be seen whether this trend will continue through the remainder of the year. The figure below shows the cumulative growth in wages by educational attainment since FH2007. It’s clear that since the last business cycle peak, right before the Great Recession began, college and advanced-degree workers have seen stronger wage growth than those with less education. However, this phenomenon is not the driving force behind rising wage inequality during this period. 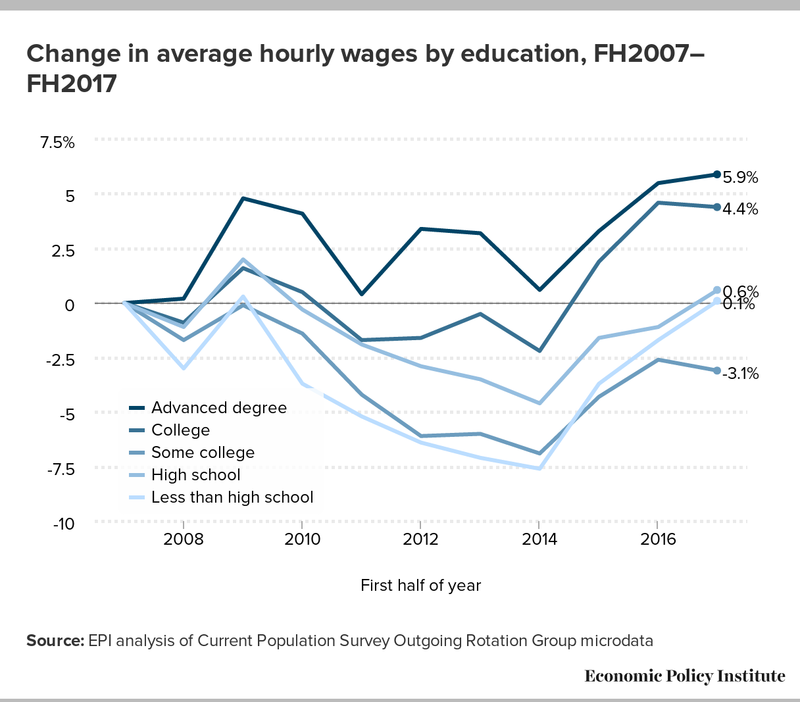 Using the first half wage data, FH2017 marks the first time that average wages for workers with a high school degree or those with less have finally reached their FH2007 levels. Workers with some college still have averages wages lower than in 2007 and lower than in 2000 (not shown). As the economy continues on the road to full employment, workers across the board should see better wage growth. I compare first halves only for consistency because they are not seasonally adjusted series.